From around 1910 through the 1970’s, Chicago was a destination for many African Americans from the rural South who moved here seeking better opportunities in an urban environment. This movement, known as The Great Migration, resulted in a cultural and demographic shifting of communities. 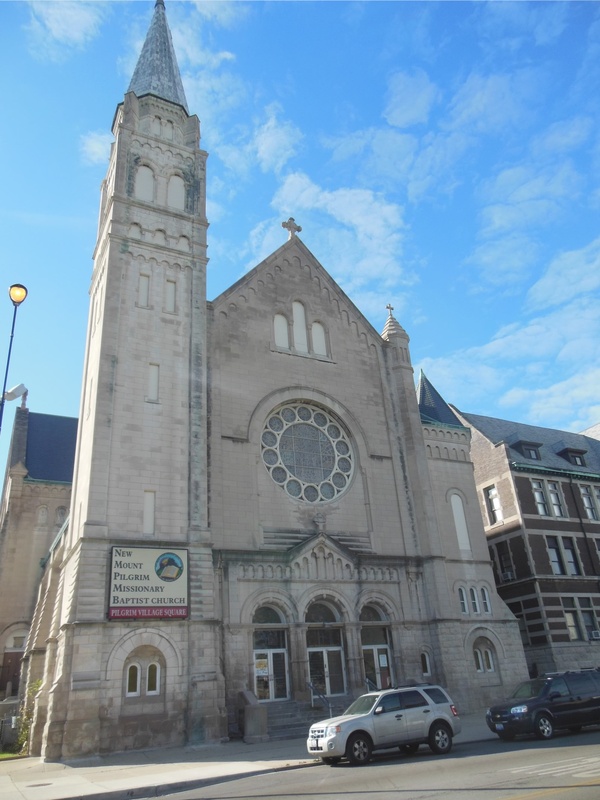 New Mount Pilgrim Missionary Baptist Church, located in Chicago’s West Garfield Park neighborhood, consciously reflects the communities’ transition from Irish Catholic to African American Baptist. Exterior of New Mount Pilgrim Missionary Baptist Church. Marshall, an active church member, lead us on a fascinating tour. 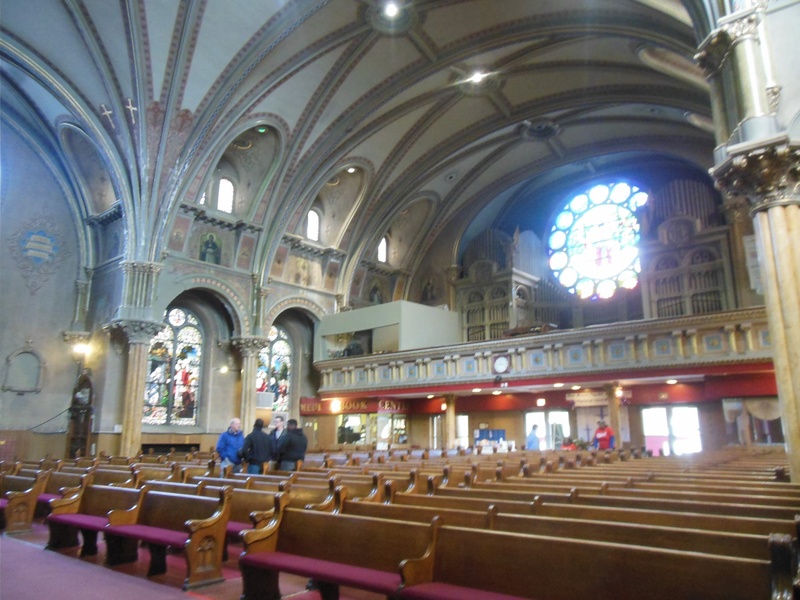 The church’s interior is well maintained and glowing with soft light—quite pretty, but the main attractions of the sanctuary are the rose windows. 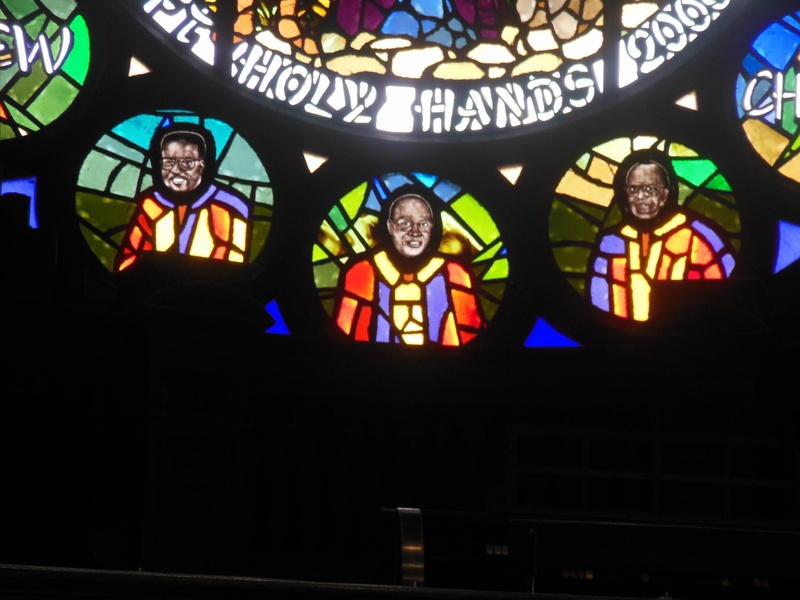 Maafa Remembrance Window c. 2000. 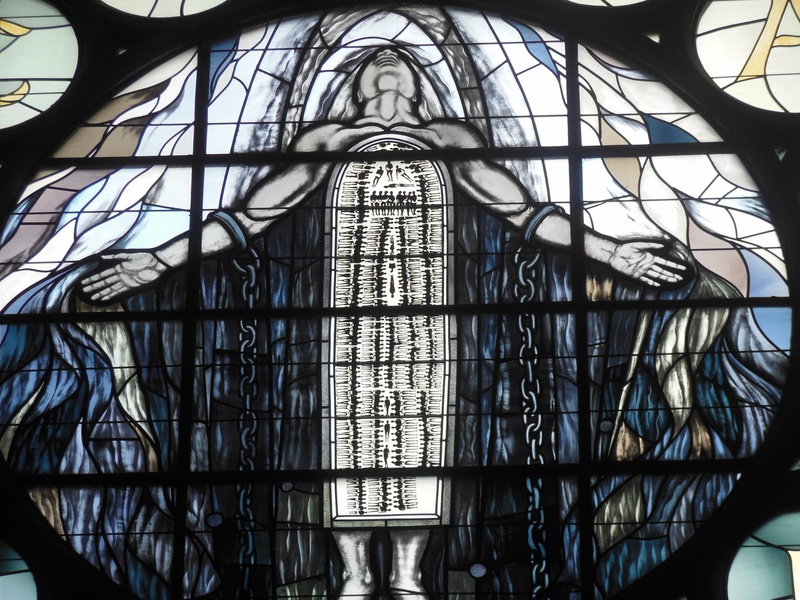 Marshall explained to us that Maafa is Swahili for “Great Stuggle”—a fitting name for a window with a central figure of a chained man whose torso is a replica of Tom Feeling’s The Middle Passage. As painful as it is to consider the horrors of the African slave trade in such a peaceful church, the tribute is a persuasive reminder that the commitment to freedom for all people, regardless of race, is an ongoing struggle. 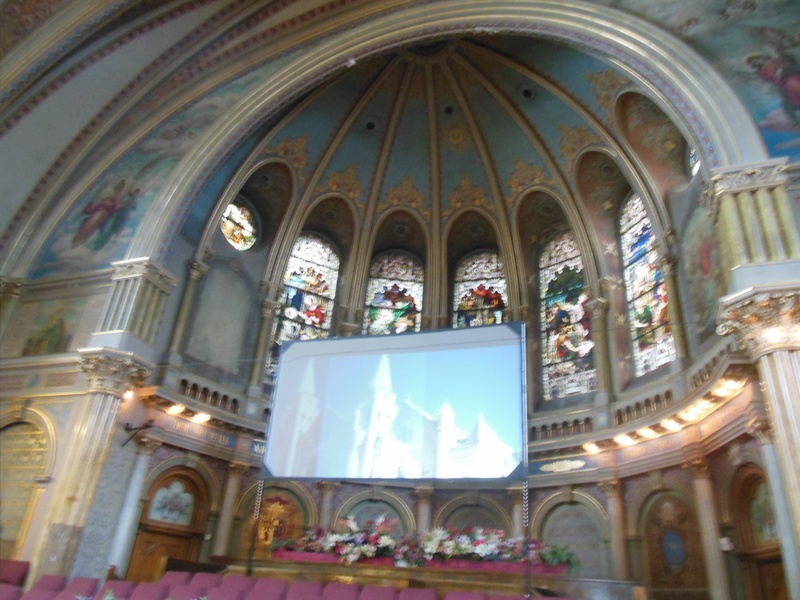 In the rear of the sanctuary, the rose window commemorates The Great Migration. I love these portraits at the bottom of The Great Migration window. 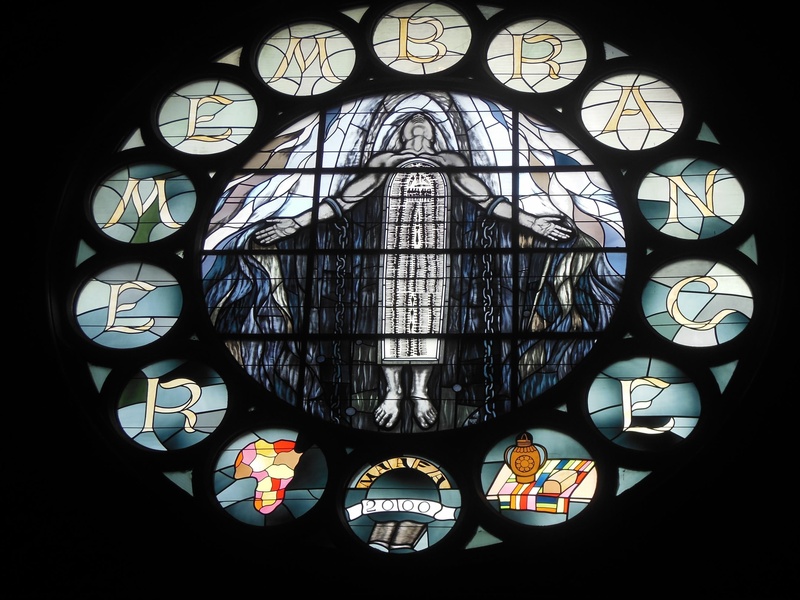 One main rose window remains undecorated—Marshall told us that the church plans a Peace Window. One completed, the church congregation will be worshiping in the midst of a commemoration of the slave trade, the history of the migration to Chicago, and a vision of a more peaceful future: quite a powerful concept indeed. 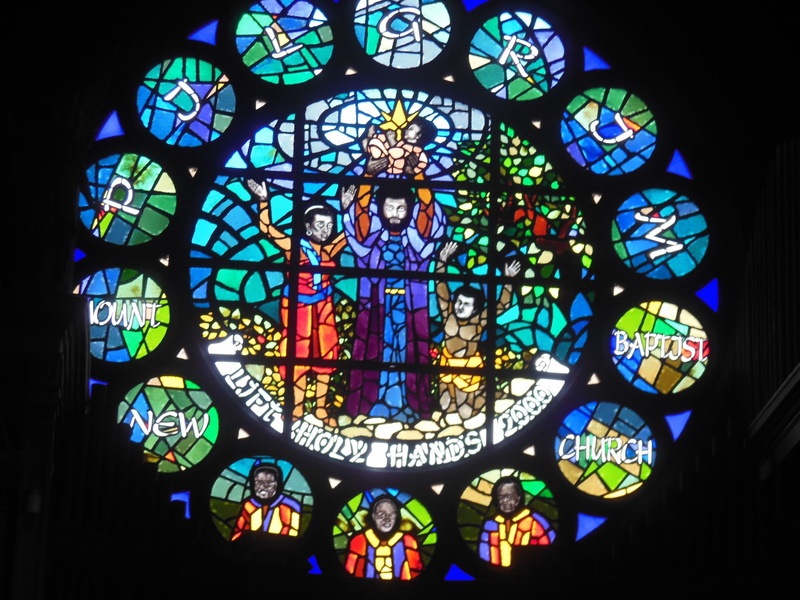 “We are the change that we seek”, a quote from the speech President Obama made in Chicago when he was elected in 2008, struck me forcefully after experiencing the original stained glass artwork in New Mount Pilgrim Missionary Baptist Church. Chicago has seen a lot of change, much of it a glorious cultural boom, while other changes reflect a shameful history of housing and employment discrimination and deliberate segregation. We could all use a reminder that we have the power to make grassroots changes in support of the cultural growth and bright future of our great shared city, Chicago. How we got to West Garfield: train. You’ve hit on the only solution to any society’s problems…get together and do something about it – because it’s pretty sure that government won’t do it for you. ← Hey budget travelers, where do you like to sleep?